After seeing all the amazing hand-made jewelry listed on Etsy, I knew I wanted to try my hand at making some of my own. When Black Friday sparked this year’s holiday shopping, I had a bit of sparkle envy; all these amazing pieces of bling were on sale but I still couldn’t afford it, what with all the money we still need to save for the wedding and all. I knew for my first couple of pieces I wanted to make something classy that I could wear on an everyday basis, but also something very simple that I could actually do from start to finish. So what’s more classy than pearls? 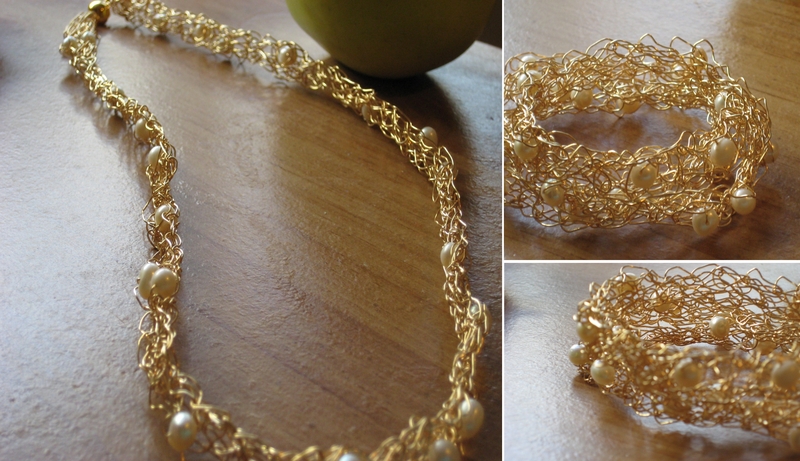 The necklace pictured in the first image is just a simple I-cord with freshwater pearls woven into it as you knit; it can also be wrapped around the wrist and worn as a bracelet. 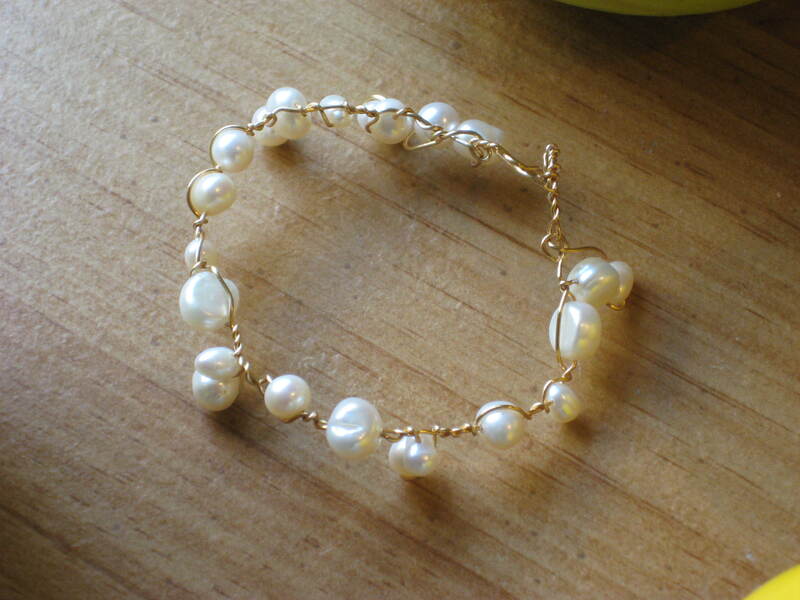 This second image is just a very basic twisted bracelet, also strung with freshwater pearls. For these pieces I used 24 gauge wire, which is slightly thicker than what you would normally use for knitting wire but I think the thicker wire looks a lot better and less fragile. String 30 pearls onto your wire. Loosely cast on 5 stitches using the backwards-loop cast-on, making sure to leave a tail of at least 5 inches. Continue knitting as you would knit an I-cord: knit one row, then slide your piece down to the other end of the needle and bring the wire around the back, and continue knitting in this fashion. I added the pearls very randomly, around 1 or 2 for every inch. To add your pearls to the piece, slide one of the pearls up the wire and place between the needles when you make your next stitch, holding it it place. As you knit, every couple of rows you want to stretch your piece a little, just to keep the cord at an even width along the necklace. When you have about 6 inches of wire left, remove needle and string your wire through all 5 stitches twice, then pull together. Use the tails on each end to attach your clasp, then weave in the ends of your wire as you would with yarn, making sure the end finishes on the top (right side) of the piece so that it doesn’t scratch your skin. Happy knitting and enjoy your new bling! → Candy Cane Vodka and a Very Merry Christmas! All the jewelry you did that seems hard, and it seems that i have to prepare lots of tools if i wanna create an item. So, Do you have any jewelry making ideas which are easier to operate, share them with me, I’ll appreciate it. Beautiful with spring. i love it. Can’t help preparing the correct jewelry making supplies and get started.